My third half marathon in a row turned out to be the best one by far. Perhaps I ended up more focused after the first two? Not sure, but I'll take it! I loved this race when I ran it in 2009 and enjoyed repeating the course. The highlight of the Detroit race is crossing from the US to Canada via the Ambassador Bridge, running through part of Windsor, and coming back through the under water tunnel. The bridge approach goes in a circle and then up the hill to bridge level, so for a long time you can see tons of runners going up and over the bridge. It's a fantastic sight with the sunrise in the background. The weather agreed with me too, about 40 degrees at the start. I was freezing while waiting around because it was a bit windy, but that quickly went away once I got into the corral crowd. I can't believe how much easier running feels when the temperatures are below 65 or so. I wore my new Oiselle Lesley tight with my singlet and arm warmers, and that turned out to be perfect. I'm now addicted to these running tights too! Huddling in the People Mover station for warmth pre-race. I didn't consider the start line crowd to be bad at all, especially when comparing to last weekend's I-can't-move-a-muscle crowd in the corral. The start was well managed and went off in groups with about 1.5 minutes in between. I was corral D, so I didn't have to wait long at all. Everyone started running from the beginning and it was easy to keep pace the first mile. I warmed up after a few minutes and ditched my throwaway layer. We ran to the bridge, then up and over into Windsor. The bridge hill in mile 3 feels substantial when you are on it, although I don't know that it's very hard in reality. Mile 4 took us down the other side of the bridge, through the gates into Canada, and started along the Canadian waterfront. I like the statues by the water, and both times there have been a good number of people out cheering through this part. The announcer at the Canadian border is fun too - he yells out names and cheers into a megaphone to pump people up. After exiting the tunnel, there are tons of people with signs cheering for the runners. And coming out of the hot uphill tunnel, it's very welcomed! From there we headed toward Cobo Arena and back into downtown. The last miles take runners through Mexican town and Corktown, more fun neighborhoods where people come out to cheer. This part flattens out nicely too, so you can make that last push to the finish. The race finishes back where it starts and the full marathon splits off just before mile marker 13. If you want to run a race with someone to pace part of a full, this is a great one for it because of the late split. They added the opportunity to run the second 'US Only' half as of this year. I might have to do that one sometime to see the rest of the full course. 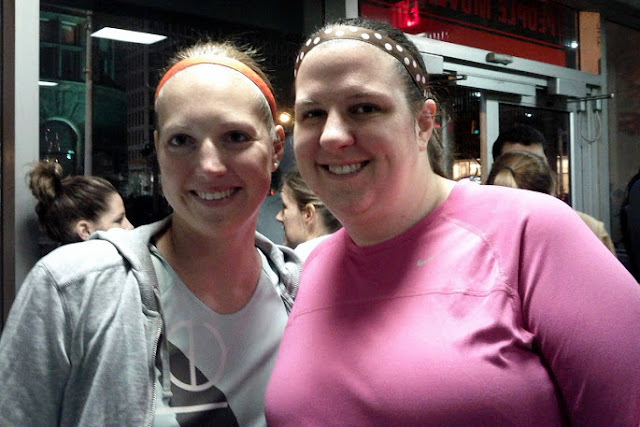 I felt great for this race, the only slight quirk being a very sore right calf muscle. It was sore for a day after NWM but didn't bother me again until the hill after the Ambassador Bridge. I stopped to stretch it a couple of times and that helped, but it still cramped up after the finish line. My breathing was nice and easy the whole time at these paces (yay cool temps!) and I finished feeling awesome. My time was another PR, also an exciting part! I LOVE the medals, one of my new faves. The ribbons are half Canada flag and half US flag, very appropriate. They also do a different car each year now, which is so fitting for Detroit. Last time I ran, the medals were circles so this is more fun. Medal close up, complete with orange manicure shot. An interesting tidbit about running NWM followed by Detroit is the stark contrast between the two courses. I went from what I'd consider the hardest half I've run to one of the easier ones, and the difference in exertion was crazy. I worked very hard for a slower time at NWM, but in Detroit it felt comfortable. I love that feeling. Running them only one week apart really exemplified the difference a course can make. After crossing the finish line, I ran into my friend Rob. He finished about 2 minutes before me and started in the same corral (him front, me back), so we basically ran within a half mile of each other the whole time. Funny. At the finish with Rob. 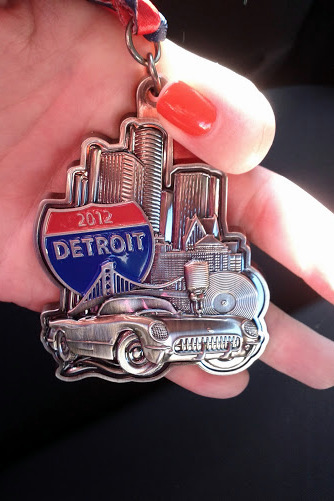 My friend Jill ran the 5K and they gave nice medals for that race event too. We headed out pretty quickly after the race because it was chilly outside for us sweaty people. With Jill post-race. Pretty fall colors. We celebrated with dinner at the Melting Pot in the evening after quite a long nap. 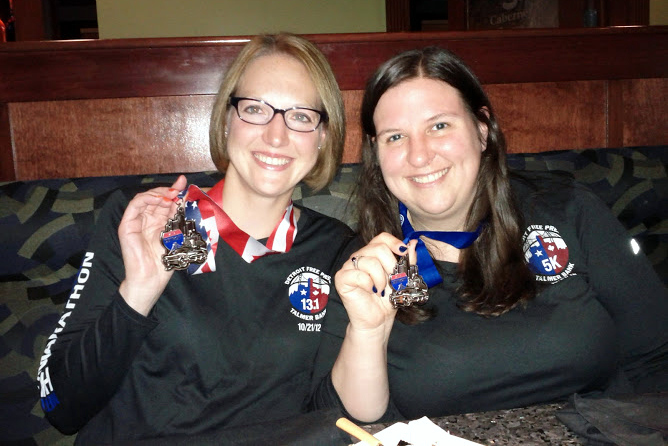 Jill and I went matching with our shirts and medals. Don't we look great? I love the detail on the shirts; each race had a separate shirt design with the correct distance on the arm, front, and back. Now for the fun race logistics! The Expo. I enjoyed the expo for this race and I'm pretty sure it's become bigger since I went in 2009. There were the normal vendors and running brands selling merchandise, plus samples of food and drinks. The races at this expo were different than the ones I've been seeing because of the location, and I visited a few tables for races I've liked in the past. The bib and shirt pick up line was super easy when I went, and that was Saturday afternoon at prime time. They had tons of volunteers manning the stations. Because of the border crossings between Canada and the US, you need a passport or enhanced driver's license to pick up your bib and then the patrol agents check for race bibs as you cross. Cool logo on the signs. Race goods. Note the detail on the shirt arm and back (flipped up), super cool. The Course. 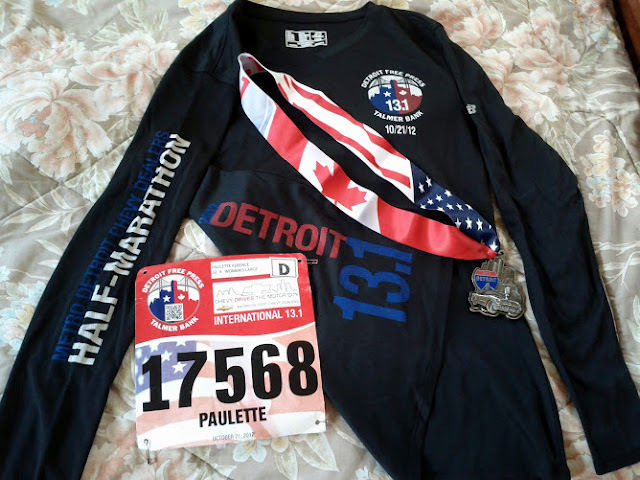 The Detroit course is especially unique because you run in both the US and Canada. I know Detroit gets a bad rep, but they truly do a nice job with this event. The route is fairly flat, the only real inclines being the Ambassador Bridge, the tunnel, and a couple of short overpass type hills. There are a decent number of people out cheering and they seem to show up at the places you need them, like coming out of the tunnel. I highly recommend this race for a fun experience! I should also mention that parking was super easy and only $5 the morning of the race. We had no traffic issues getting in and out, and we arrived around 6 am for the 7 am start time. The Support. Course volunteers did a good job with water and Gatorade, they didn't slow people down going through the stations from my experience. I found there to be plenty of water stations for my needs and porta potty lines didn't look bad. They didn't hand out gels during the half, although I usually don't take the provided ones so not an issue for me. The start line volunteers were well-organized and kept people in the correct corrals, then moved the ropes to make the start flow easily. The Finish Line. The finish was super easy and not backed up at all because they have a ton of space for runners to keep going straight through. There was water and gatorade first, mylar blankets for warmth (much needed! ), massage, and a food line. I know there were pretzels and fruit plus more, although I didn't go through the food line because I didn't want anything but fluids at that moment. We parked very close and headed back to my friend's town and breakfast shortly after. Another nice touch - the people handing out the mylar blankets actually came behind me and wrapped me up! That's all I have on this one - I loved the experience for the second time and hope to go back! That is a REALLY nice shirt, and a great medal - love the detail on the ribbon! Congrats, another solid race for you!! Congrats on a great race! 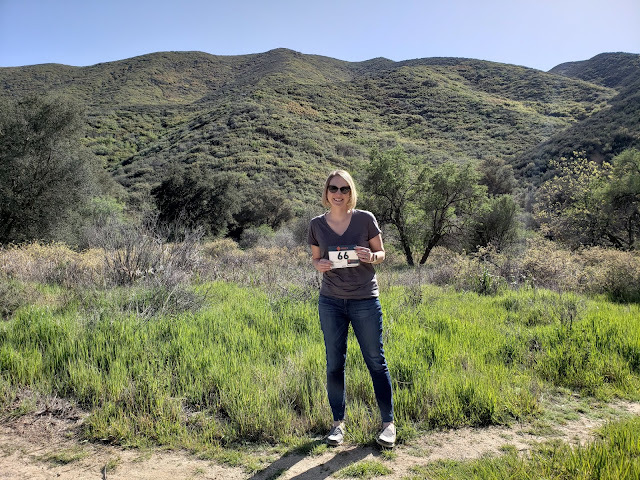 I ran this last year and also loved the course - not every day you get to run in two countries - and I think the shirt and medal are fantastic too! Glad to hear you had a great experience! Yes the 2 country run is a highlight! So cool. This race sounds so cool, going through the US and Canada. I love that medal! 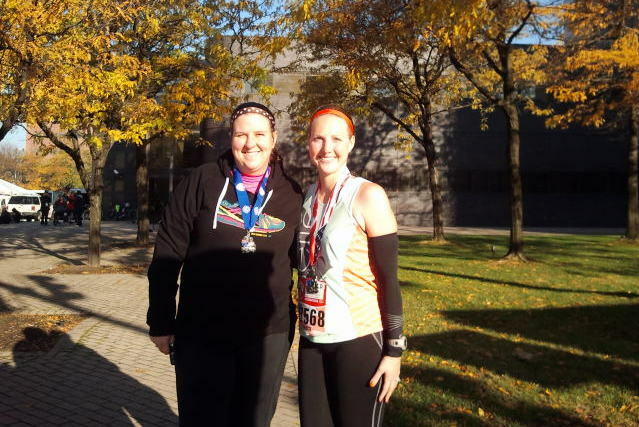 I was at the Zooma Half Marathon this weekend, and my blogger friends were totally jealous of that medal. Congrats on another great race!! Congrats on another PR! You deserve a few weeks off before your next half. ;) Very cool medal + ribbon too! Thanks Natalie! Yes, I get time off now. Phew! DAMN GIRL!!!!!! Nice new PR!!!!! WOW!!!! I'm so impressed! 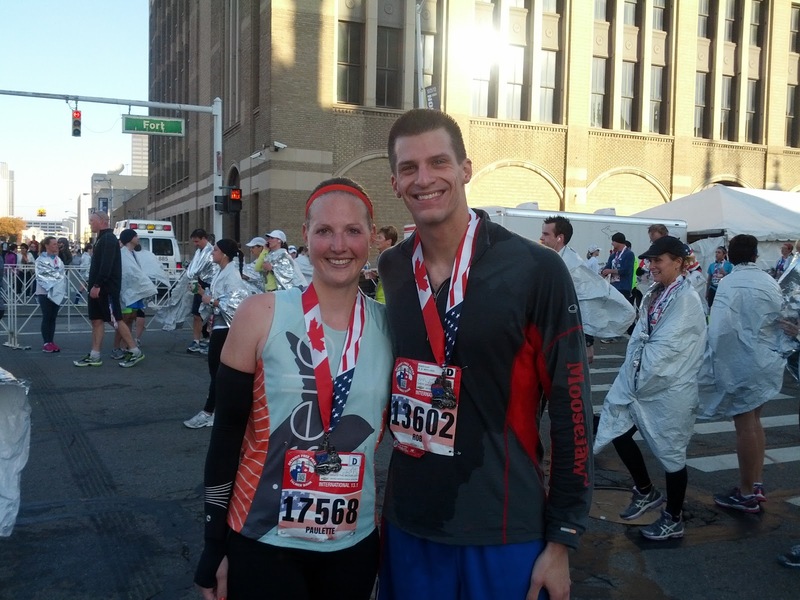 After reading a couple Detroit race reports, I'm almost certain I want to do this race next year or the year after. AWESOME!! Thanks! And I highly recommend - after running as one of my first races and coming back to it three years later, I appreciate it so much more. You should - even without the tunnel stats. Tunnel is only a mile, but my stats were weird for a bit so I blocked out 2. Great work Paulette! Congrats on the PR! EXCITING! 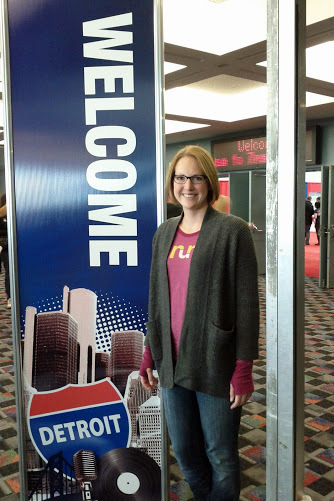 I loved Detroit too... especially the corrals are awesome there. Would def do this race again as well! Cool - always glad to see people liking this race! I used to run your location circuit and I totally miss those races. Congratulations! I ran the half this year as well. My race report is at http://www.gorunagain.com/2012/10/26/detroit-half-marathon-2012-race-report/ I was just a couple of minute behind you. What a great day for a race! Awesome! My boyfriend's family is in Detroit and his dad is trying to convince me to run this race...now you've convinced me! So glad! I think you'll enjoy it!